Tokyo, Geneva, Chicago – 12 June 2013. A five-volume report containing the blueprint for a future particle physics project, the International Linear Collider (ILC), was published today. 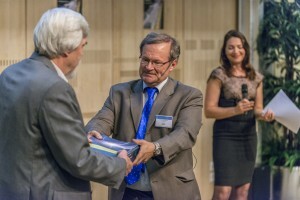 In three consecutive ceremonies in Asia, Europe and the Americas, the authors of the Technical Design Report for the International Linear Collider, a next-generation particle collider to complement and advance beyond the physics of the Large Hadron Collider at CERN, officially handed the report over to the international oversight board for projects in particle physics, the International Committee for Future Accelerators ICFA. The Technical Design Report presents the latest, most technologically advanced and most thoroughly scrutinised design for the ILC. In a global event starting in Tokyo, Japan, continuing at CERN in Geneva, Switzerland, and ending at Fermilab, Chicago, in the United States, scientists and their guests are celebrating this achievement in symposia, public events, receptions and a series of handover ceremonies. At each regional part of this global event, one full set of the report is handed over and the three regions give each other a virtual handshake by videoconference when one celebration ends in one time zone and the next starts in another. “The discovery of a Higgs boson at the LHC has made the case for the ILC even more compelling. The ILC can study its properties in detail and will thus be a great complementary machine to the already very successful LHC,” said Sakue Yamada, Research Director for the ILC. “The Technical Design Report is an impressive piece of work that shows maturity, scrutiny and boldness. The International Linear Collider should be next on the agenda for global particle physics,” said Lyn Evans, Director of the Linear Collider Collaboration. The Technical Design Report (TDR) marks the completion of many years of globally coordinated R&D and completes the mandate of the Global Design Effort. It contains all the elements needed to propose the ILC to collaborating governments, including a technical design and implementation plan, that are realistic and have been optimised for performance, cost and risk. The design effort continues in the new Linear Collider Collaboration, which combines the two most mature future particle physics projects at the energy frontier, the International Linear Collider and the Compact Linear Collider (CLIC), in an official organisational partnership to coordinate and advance the global development work for the linear collider. Organised by the Global Design Effort (GDE), a team of scientists from around the world, the ILC is an international endeavour that brings together more than 1,000 scientists and engineers from more than 100 universities and laboratories in over two dozen countries. Consisting of two linear accelerators that face each other, the ILC will accelerate and collide electrons and their anti-particles, positrons. Superconducting accelerator cavities operating at temperatures near absolute zero give the particles more and more energy until they collide in the detectors at the centre of the 31-kilometre machine. At the height of operation, bunches of electrons and positrons will collide roughly 7,000 times per second at a total collision energy of 500 GeV, creating a surge of new particles that are tracked and registered in the ILC’s detectors. Each bunch will contain 20 billion electrons or positrons concentrated into an area much smaller than that of a human hair. This means a very high rate of collisions. This high “luminosity”, when combined with the very precise interaction of two point-like colliding particles that annihilate each other, will allow the ILC to deliver a wealth of data to scientists that will allow the properties of particles, such as the Higgs boson, recently discovered at the Large Hadron Collider at CERN, to be measured precisely. It could also shed light on new areas of physics such as dark matter. The Linear Collider Collaboration is an organisation that brings the two most advanced linear collider designs, the Compact Linear Collider Study (CLIC) and the International Liner Collider (ILC), together under one roof. Headed by former LHC Project Manager Lyn Evans, it strives to coordinate the research and development work that is being done for accelerators and detectors around the world and to take the linear collider project to the next step: a decision that it will be built, and where. Some 2,000 scientists — particle physicists, accelerator physicists, engineers — are involved in the ILC or in CLIC, and often in both projects. They work on state-of-the-art detector technologies, new acceleration techniques, the civil-engineering aspect of building a straight tunnel of at least 30 kilometres in length, a reliable cost estimate and many more aspects that projects of this scale require. The Linear Collider Collaboration ensures that the synergies between both projects are used to the maximum. Very exciting; however, if placed in Japan what sorts of precautions are going to be made about earthquakes. Japan is about the most seismically active area on the planet. Seems like even a little shift would result in a huge amount of work to rectify. Actually that part of the engineering would be pretty fascinating as well!